Those out of the box folks at the Meyocks Group had some good news to share while I was there yesterday. When you land a new account it’s always time for a celebration! WEST DES MOINES, Iowa – March 14, 2005 – Firestone Agricultural Tire Division has named The Meyocks Group as its agency of record for all marketing communications. This includes the company’s agricultural, construction, forestry and ATV tire segments. Headquartered in Des Moines, Iowa, Firestone Agricultural Tire Division has more than 60 years of experience in manufacturing durable, high-performance tires for the agricultural, construction and forestry industries. For more information contact Doug Jeske. According to a release I just received from Brandy Craig at Archer>Malmo, Select herbicide from Valent is doing very well with the growers of four different commodities. WALNUT CREEK, Calif. (April 7, 2005) – Select® Herbicide has once again achieved the No. 1 spot in customer demand for cotton, soybean, sugarbeet and sunflower growers, according to Doane ag data. 2004 makes the fifth year Select has emerged as the No. 1 grass herbicide for cotton, soybeans and sugarbeets and the second year it has been named No. 1 for sunflower growers. For more information contact either Brandy Craig or Lori Theine. Today I had a great meeting at Meyocks Group in Des Moines. We talked about public relations, Talking News Releases and blogging. I sensed a high level of interest in blogging and hope I was able to offer some good basic information through demonstration and discussion. If you look back through my previous posts and at all the links on our blog you’ll find many resources you can go to about various aspects of blogging. I tried to anticipate questions in my presentation but some of the ones that were asked included, “Do we measure how many reporters use the releases we send out?” and “What’s different about your service and NAFB’s?” I have written about both these questions and would encourage you to look back in the archives of the category, Talking News Release to visit them. I want to thank Jill Green for inviting me in today. I interviewed Doug Jeske for an upcoming ZimmCast. Doug’s a Senior Vice President, Account Services for Meyocks Group. Today I’m still in Des Moines and at the Meyocks Group office talking about blogging. Blog Readers In The Agrimarketing World? There certainly are blog readers in the agrimarketing business! This is now a documentable fact according to the results of Agri Marketing’s (magazine) first monthly online poll. They asked visitors to respond to a simple question, “How often do you read blogs of any kind?” The results are posted on their home page and are worth a look. You can also find articles in the March issue about blogging, including one written by yours truly at the request of Agri Marketing. As I would have suspected from my on-going informal poll of agrimarketers I come in contact with, the majority said they didn’t at all. But only by a small margin, meaning that many do. I think this monthly poll is a great new feature of the Agri Marketing website by the way and I applaud them for starting it! As you can see from my earlier posts today and you will see tomorrow, there’s definite interest on the part of agencies about this new web communications phenomenon. Clients are asking about it. Are you ready to answer them? Our weekly podcast, the ZimmCast, will feature interviews with agency representatives, talking about what they’re doing when it comes to blogging and how they see it fitting into an overall communications and marketing plan. The folks at Edelman, a global PR firm, and Intelliseek, a marketing intelligence firm, have produced a great document on blogging you should download and read. They claim that blogging isn’t a passing fad but any company that fails to grasp this fact may be. Pretty strong words about something that has received little attention in the agrimarketing world! One of the nice things about blogging is that it’s so easy to do. My last post was done during a demonstration and presentation to a group of staff members at Two Rivers Marketing in Des Moines. We’re done now and I’m posting one more time before leaving. Two Rivers has their own internal IT department to conduct work for their clients so I thought it interesting that they needed me to come give a presentation on blogging. But this shows how new it really is to us in the agrimarketing business. We only had 1 hour to go from a definition of “blog” to how to post and distribute information on the blog and using RSS feeds. We did get into podcasting at the end. I brought along my Dell AXIM with a ZimmCast already loaded on it to demonstrate how easy it is to distribute your own audio programming now. Of course I wanted to show them a podcast on my new Zen Micro but the one I ordered came in defective so I’m waiting on its replacement. I hope the session was helpful to these great folks. I know they gave up a lunch hour to hear yours truly but our internet access worked and I think it went well. If you’d like me to give a presentation or demonstration on blogging, podcasting or using Talking News Releases just give me a call. 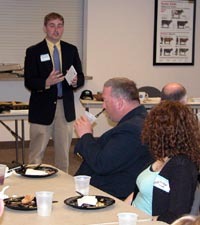 During my demonstration at Two Rivers Marketing in Des Moines, IA I’m showing how to post “live.” More to come later. I love getting releases like this because they come with pictures. I like pictures and need practice using them on a blog (the web). Hopefully at this year’s Ag Media Summit I can attend a seminar and learn how to use them more effectively. If you’ve got any tips you’d like to share with me please feel free to email me. I can handle constructive criticism too! Thanks to Cathy Bewley for sending this along! PLAIN CITY, Ohio, April 5, 2005 – Select Sires has announced the hiring of Terri Smith as its sales and marketing specialist. In this role her main responsibilities will be coordinating the photo program and producing promotional materials on a national and member cooperative level that support Select’s industry-leading image. Smith will be based at the company’s headquarters in Plain City, Ohio. We had a great meeting today in Columbia, MO at the Missouri Cattle Industry Headquarters. It’s the monthly meeting of the Missouri Agricultural Leaders Luncheon. This is an ad hoc group, meaning no memberships, no dues, nothing but great monthly meetings on topics of interest to the agricultural community. Of course, someone has to coordinate it voluntarily, hence ZimmComm’s involvement! Today, Alex Stemme, Missouri Soybean Association, gave a talk on the new Missouri FFA Foundation Fund. This is an effort to raise money to create an endowment that will be able to provide financial support for FFA on an on-going basis. You can contact Alex at MSA for more information if you’d like to contribute. They’re also looking for some volunteer leaders too.